The electronic payment can be made by using with the following payment cards: Visa; Visa Electron; Mastercard; Maestro (only if there is a CVV2 / CVC code on the back of the card), the payment will be made through our partner Stopanska Banka AD Skopje, through the online payment system cPay Mk of Casys which aims is to secure online payment according to all the world’s security standards prescribed by Visa, Master Card and other financial institutions. The electronic payment process is carried out according to all world standards for Internet billing with the highest level of security and confidentiality. At the communication between the customer and the processor, CPU 128Bit SSL encryption is used. Connections are provided with SSL protocols – Paradiso Fly Travel Service implements the highest possible security standards. It is mandatory to make a Reservation for the selected arrangement from the current offer or Request for a particular desired offer if it is not present/listed in the current programs. They can be made over email, phone or directly through the reservation button under each arrangement, where basic details of communication with the client should be provided, such as, email address and phone number. On the delivered communication email, the client receives a confirmation for the requested reservation or offer for the desired destination according to your requirements if it is not listed in the current programs. 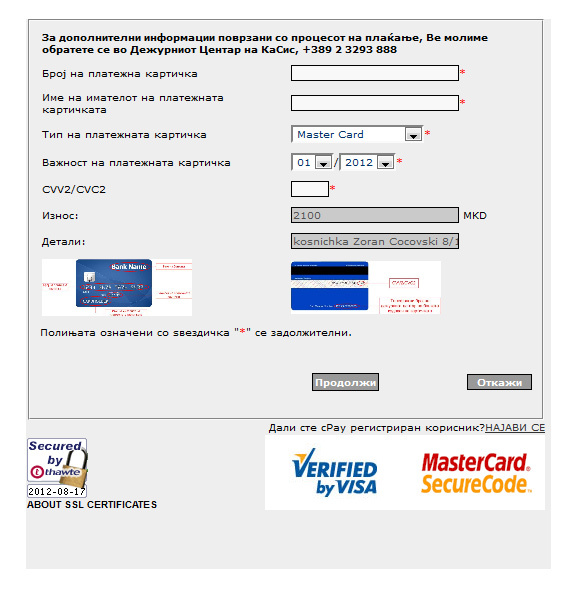 The message provides payment instructions, data and details of the arrangement, the exact payment amount that cannot be changed by the user in order to avoid possible errors, as well as a purpose-generated secure link for the offer through which the electronic payment is ready to start, which is done exclusively in Denars (MKD), and an information display of the amount in equivalent in EUR (€) is given. In the reservation or offer, a time limit for the validity of the tender will be determined, depending on the type of the arrangement and the conditions. From the secure link on which the payment begins, the costumer is redirected to the secure web site of the credit card payment portal: www.cpay.com.mk where he inserts the data from the payment card necessary for the realization of payment, with what is additionally protected from card payment abuse. The data you need to complete for the card payment are: Card data (number, date of validity, 3-digit security code (CVV2 / CVC2), name of the owner, bank name and telephone number of the duty bank’s centre that is issuing the card). Once you have entered the required data next what you need to do is click on the field to continue. If you make a successful payment of the Casys system, you receive a confirmed email from Paradiso Fly Travel Service that your order has been done and is processing. After completion of the transaction processing, the costumer is redirected back to the online sales place- the website: paradisofly.com.mk. Your credit card number is transferred via SSL directly to Casys’s secure Cpay processing system and Paradiso Fly Travel Service doesn’t have any access to your data and has no access (at any point of time) to your credit card number . Due to the multiple checks and confirmations of the offer for the arrangement by the side of the costumer and the possibility of controlling the payment in all steps, after the already preformed payment, the funds are not refinanced. Transaction may be successful or unsuccessful – cancel payment by the User in the third step or rejected payment. Besides the information displayed in your browser, a message will be sent to your e-mail address with detailed information about the outcome of the transaction and the payment. If the payment is completed successfully, a sales invoice will be generated and you will get it in your e-mail with a voucher issued for your arrangement. If the transaction fails, although you have entered all correct card information and if the card is still valid, please contact Your bank for more information to see why the transaction is rejected. The reasons can be various and Your bank will give you the most accurate information. If a system error occurs during the attempting to pay via Internet Explorer, please try by using another browser. If you suspect to abuse, please contact +389 2 3062669 or paradisofly@paradisofly.com.mk and at Casys www.cpay.com.mk. Paradiso Fly Travel Service doesn’t take responsibility in case of username abuse or credit / debit card abuse, used for payment. Paradiso Fly Travel Service, the technical personnel and the website administrator do not accept the responsibility of any possible damages that could occur to the user of the e-payment service while using the service or due to the unavailability of the service in certain period.